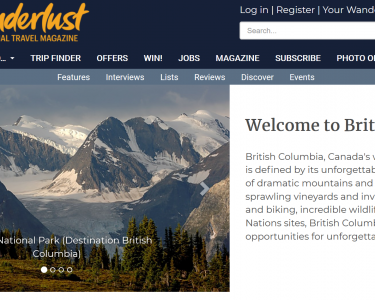 Destination BC is collaborating with Wanderlust magazine to run a three-month print and online campaigns howcasing Thompson Okanagan, Northern British Columbia, the Kootenay Rockies, Northern Vancouver Island and the Great Bear Rainforest. Wanderlust’s award-winning creative team has generated original and engaging content for the campaign – supported by Destination BC’s hero imagery and videos – to inspire readers to choose B.C. as their next must-visit destination, and also associate the province with a modern and highly respected travel brand. Canadian Sky, one of Destination BC’s key UK account tour operators, partnered on the call-to-action for the campaign. Canadian Sky/DBC retargeting ads are placed throughout the WanderlustContent Hub, where readers can easily book B.C. vacation packages. The packages feature several regions and iconic experiences across the province.